The Digital View “Controller Utility” application for Windows enables users to set and record their own LCD panel timing. Although Digital View LCD controller boards have multiple LCD panel timings pre-programmed and selectable via mini-dip switch there are always new LCD panels being released. We provide a service to add the required panel times but this may (but not always necessary) require providing a LCD panel sample. Alternatively users can use the Panel Timing function in the Controller Utility, a free for download application to set the LCD panel timing themselves. 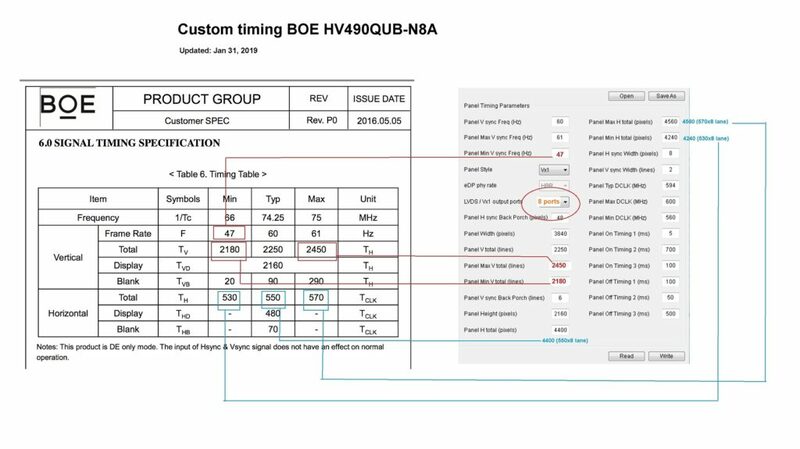 Shown in the attached is an example of the timing for the BOE HV490QUB-N8A and the SVX-4096. The application notes for download below show an example of the process using the Digital View LCD controller board model SVX-4096 and SP-1920. For more details regarding firmware updating see the manual for the specific controller (follow the link to the specific model’s webpage here). Also check the Controller Solution Generator to ensure there isn’t already a timing and cable solution for the panel. If you run into difficulties please feel to contact us by phone or the webforms on any of our webpages.